Cristiano Ronaldo's long reign as the king of European club football is over, and a familiar rival is waiting in the wings to claim his crown. As Ronaldo was exiting the Champions League with Juventus on Tuesday evening, ending his hopes of a fourth-straight winners medal in the competition, Lionel Messi was guiding Barcelona to the semi-finals with a star turn in the victory over Manchester United. Messi scored twice - the first a superb curling effort from the edge of the box, the second a gift from David de Gea, who allowed his tame shot to squirm beneath him and into the net. Ronaldo also netted, for the 126th time in the competition, but it was not enough as Ajax came from behind to claim a 2-1 win on the night in Turin and a 3-2 aggregate victory overall. 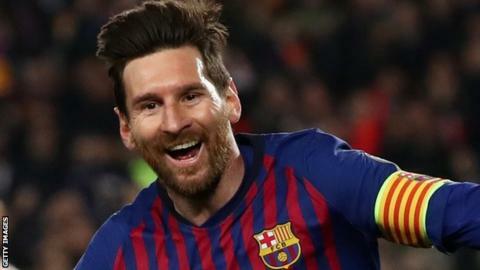 Barca go through to a last four showdown with either Porto or Liverpool, keeping alive Messi's hopes of a fifth Champions League winner's medal to match the tally of his Portuguese rival - the only other man in world football fit to be considered in the same bracket of class as the Argentine. Can Messi match Ronaldo's record? Ronaldo has scored 126 goals in the Champions League, with an incredible 65 of those coming in the knockout stages. The last time he did not reach at least the semi-final stage was the 2009-10 season, when his Real Madrid side were knocked out in the last 16 by Lyon. Ronaldo's wins in 2008 and 2014 were added to in each of the last three seasons, but he will not be reaching a fourth straight final thanks to Matthijs de Ligt's header for Ajax. The forward has played 48 Champions League games since the start of the 2015-16 season - winning 31, drawing eight and losing eight. In that run he scored 49 goals and picked up 14 more assists. Ronaldo's first-half header in Turin saw him score his 25th goal in a Champions League quarter-final, while Messi had to end a bit of a drought against United. As he nutmegged Fred and curled past David de Gea, Messi grabbed his first quarter-final goal since April 2013 versus Paris St-Germain, ending a run of 12 matches and 50 shots without a goal in quarter-final matches. "Messi is an exceptional talent," said United manager Ole Gunnar Soslkjaer. "He and Cristiano have been the best players in the world in the last decade. He showed why we all think that and why he's won so many titles and why this team have won so many Champions Leagues." Messi, 31, has now scored 45 goals in all competitions for Barcelona this season - 10 more than any other player in the top five European leagues. Juventus spent the thick end of £100m to sign Ronaldo last summer - and the 34-year-old was brought to Turin primarily to end their now 23-year wait for a third European Cup triumph. How much longer can he continue to score at the highest level? Well, Portugal's captain shows no real signs of slowing down. He has scored 19 goals in Serie A this season and ends the Champions League with six. He signed a four-year deal with Juve last summer and we can expect the two to continue to trade goals - and titles - at the very top level.